Anyone who's been reading my blog for a while will know how much I love my Missguided Marilyn trousers, so I do feel a bit like I'm cheating on them with these Kimbriella ones. The fit's quite similar which is good as it saves me running my poor Marilyn's into the ground, but they've got different waist detailing from one another which makes for a bit of a change and also lets people know I'm not that stinky kid who wears the same pair of trousers and over and over. I wore it with this shamazing cropped sleeve leather jacket (why are these so hard to come by?) 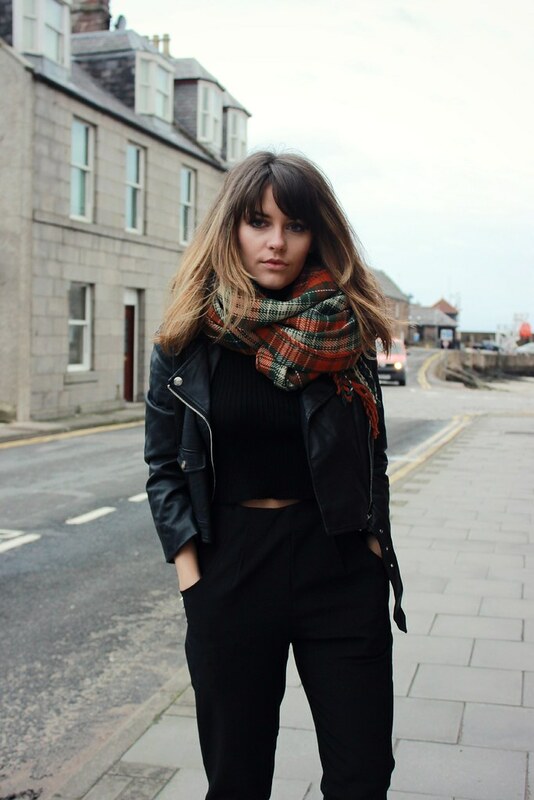 with a little bit of tartan thrown in in the form of this scarf from Olive & Frank. A leather jacket + black bottoms + an oversized scarf seems to have become my uniform as of late, but, as they say, if it ain't broke don't fix it, chiddlers. that scarf is amazing! love the plaid! Perfect 'uniform'! Black never fails.. Love the scarf! I love that scarf, gorgeous! This is soo great! Very chic, sophisticated. Love these black outfits! I love everything about this outfit!!! I was going to go into more detail but I just love it all, you look awesome! your scarf is perfect!! i love the colors. Ooh that tartan scarf is so lovely! Wow a stunning outfit! You have such a great figure, I love the scarf! Love the outift, looks so good on you!! Love this outfit! Just I wish could I wear a pair of trousers like that :/ but the top half is quite me. I do like my tartan and my leather jacket and seem to be living out of them at the moment. It works though so I will continue until I get bored. So many things I love about this outfit - I'm new to your blog by the way, and I love your style! I love the pants, and that you went with a monochrome look and and a crop top. So cute!